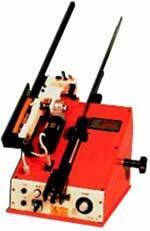 Dual Inline Package Lead Straightening Machine for DIP Components. The straightening machine A075/Ri is designed to straighten the leads of dual inline components utilizing a tube to tube feeding configuration. Fully adjustable, the A075/Ri requires no die changes, which allows a wide range of sizes to be processed quickly and easily. The lead span adjustment is displayed on a digital panel meter and the operating speed is infinitely variable.